The Buddhists and Hindus teach that earthly existence is a continual wheel of circular motion, fueled by desires that entrap us within that motion, like a potter’s wheel or a water mill–or, to be more modern, a clothes dryer or the food processor. And as the famous actress Betty Davis once said “Life–it’s not for sissies.” So I’m going to give it to you straight. This recipe is a cake with flour and sugar in it. Yes, it’s gluten-free flour. And yes, there’s only a half cup of sugar. But flour is flour and sugar is sugar. Period. Ever since I was a little girl, I’ve always loved to bake. The girl scout badge that required me to make a layer cake and frost it was one of my most treasured. 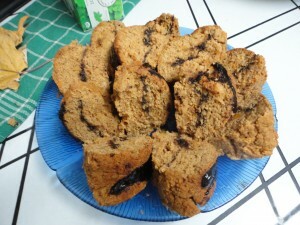 In fact, for a time, what I wanted to be when I grew up was a baker. It’s in my blood. My maternal grandmother’s brothers ran a bakery. My grandmother taught me their tricks about not burning pie crust in the oven and how to cool a cake. I still have a pastry cloth my grandmother gave me that harkens back to these times. But I don’t make pie crust anymore. (I do make dog biscuits for Romeo, though, so I still use my rolling pin now and then.) And I don’t usually make cakes. So I will blame this cake on the internet, and an image somewhere on Pinterest of a chocolate sweet potato cake. It looked nothing like this one, but it got my “wheel” turning. Not so much to taste the cake, but to create one that would be in the ball park of healthy, for a special holiday treat. And to see if I could do it after all this time. The first two years I ate plant-based, I baked every week. I was so thrilled to be feeling better and so thrilled I COULD bake again, just fat free at first, and then gluten free, too, once my “science experiment” to test whether wheat would be okay for me to eat without all the fat showed me that no, that had not changed. I am forever indebted to two amazing women for all I learned about baking in this new way: Susan Voisin of Fat Free Vegan Kitchen, and Karina Allrich at Gluten Free Goddess. If you need to learn how to do both of these things, besides the meager advice I offer here, I highly recommend you hop back and forth between the recipes on their two blogs to figure out how to do both in your own individual way. Your education will be invaluable. I made this cake twice. 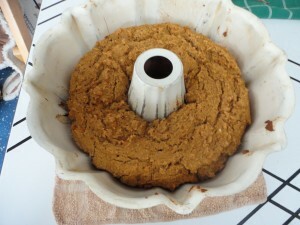 The first time I used Susan’s Applesauce Ginger Cake as a template. I had made it before (for company) as the applesauce cake it is meant to be, only gluten free, and it had come out fine. This sweet potato version came out good, but I thought it was a bit too heavy, and maybe a tad too dry. Since mashed sweet potato is more dense than applesauce, I went back to Karina’s Pumpkin Bundt Cake recipe to check her proportions of leavening and liquid. I kind of hopped back and forth between the two recipes to decide on my own measurements. 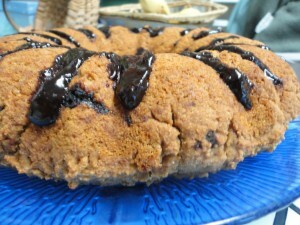 The inspiration for the carob apricot filling also came from two divergent places: wanting to come up with a tasty, creative riff on the chocolate sweet potato cakes I saw out there, and wanting to avoid the disappointment of putting a glaze on the outside of the cake, only to have it soak all the way in. This is a recurring problem I’ve had with icings and glazes on gluten free baked goods. So I got the inspiration to beat that chemistry to the punch by putting a gooey, luscious fat free filling on the inside of the cake. Combine dry ingredients in a large mixing bowl. (I use a fork or a whisk to do this.) In a smaller bowl mash together and combine all the wet ingredients with a fork, except the egg replacer, using the lower amount of almond milk. Mix the egg replacer with the 2 tbs of liquid separately in a small cup or bowl. Now make the filling so it’s ready: in another small bowl, whisk all the filling ingredients together until well combined (a fork is great for this). When you’re ready to assemble, add the wet ingredients to the dry ingredients, along with the egg replacer. Mix gently with a wooden spoon or spatula until it’s all combined. It will be a thick batter with small orange specks of sweet potato in it. If it seems too stiff, add the rest of the almond milk. I found that gave the batter the right consistency–my climate is dry and so is my wood heated house. But it may be different at your place. Chances are you’ll need it though. Carefully spoon half the filling into a bundt pan. 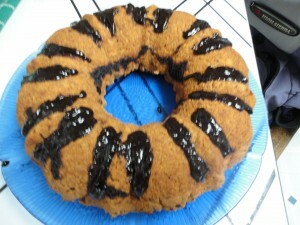 (You can if you want to, but I did not grease or oil the pan and the cake came out fine. Old trick to follow in notes.) 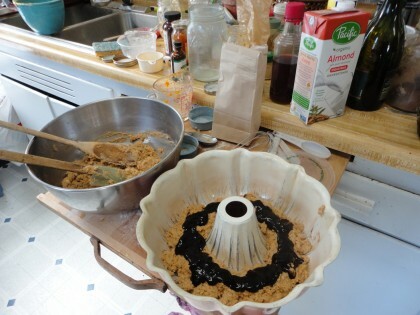 (If you don’t have a bundt pan, I think you could do this in a square 8 x8 baking pan too.) Carefully spoon most of the filling down the center of the batter, leaving back a little to decorate the top of the cake if you wish. Bake at 350 for about 40-45 minutes. Longer than that would have dried it out in my oven. But keep an eye on it. When it seems firm, it’s done. You can test it with a toothpick as well if you like, but that’s a little tricky with the filling in the middle. 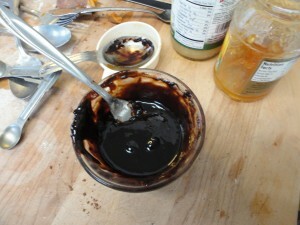 After it cools completely (and I mean completely) you can use any leftover filling as a glaze. Notes: Flours and Starches: I learned from Karina at Gluten Free Goddess how to make my own mixes. The general proportions are something like 2/3 flours to 1/3 starches for a good mix. If you want to bypass all that chemistry experimentation, you can buy a gluten free baking mix. I can’t recommend one, though, because I’ve never used one before. Just be sure it’s vegan. Some are, some aren’t. 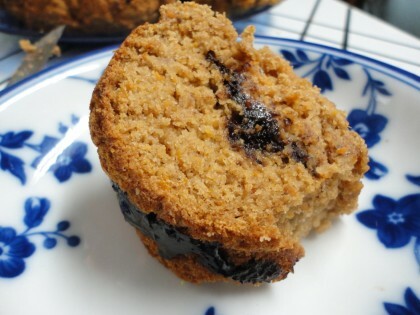 If you don’t need to be gluten free and you would like to try this cake, just use two cups of something like whole wheat pastry flour, and instead of 1 tsp of baking soda and 2 tsp of baking powder, leave out the baking powder and use 2 tsp of baking soda. You may only need the lesser amount of almond milk. And you may not need the egg replacer. 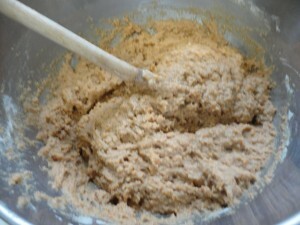 You can follow Susan’s directions for her Applesauce Ginger Cake and see how it goes. So if you have a sense of adventure like my hostess did, or want to unleash your mad scientist in the kitchen, try this cake out as a holiday treat. Or if you are a died-in-the-not-wool traditionalist, try out my Pumpkin Pie in the Free World. And that’s how the Samsara dessert wheel turns. Gluten or no gluten in the flour, a little sugar or a lot, it’s not for sissies. 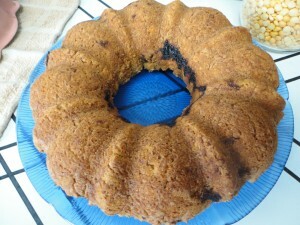 I am grateful the small amounts of this cake I did eat produced no fibromyalgia flares. I bravely took the rest home. Gave some to my neighbor. Put the rest in the freezer–until company comes, and it’s time to spin the wheel again. That looks tasty! And kudos for the patience to try and try again until it was perfect. 🙂 I love the picture of your kitchen filled to the brim with cooking stuff- it’s how a good kitchen should look! Yum ! This looks so good Maria, you’ve done it again : ) and I’m glad it didn’t give you a fibromyalgia flare. Thanks Angela! Glad to know you’re a messy cook too. 🙂 And a Happy Thanksgiving back to you. Looks yummy. I plan to make it up in a couple of weeks and will let you know how it goes. Thanks. Welcome, Linda Grace! Thanks! Look forward to hearing how it goes. And seeing you too! Moonwatcher, I am thrilled to meet you here in cyberspace. Your journey is beautiful, as are you. When you want company, check my food blog (sporadic but delicious) eat2thrive.blogspot.com – also oil free, wheat gluten free, vegan, whole grain/veggie based, and perhaps visit my musings on seeinginsideout.blogspot.com. The solidarity and love I feel as I read this recipe is amazing. I’m going to experiment a bunch with pumpkin and sweet potato and if successful, will blog that too. Haven’t used any egg replacer .. is it necessary?